Someone in your company agreed to participate in an industry trade show. Now it's your responsibility to ensure it's successful. Where do you start? 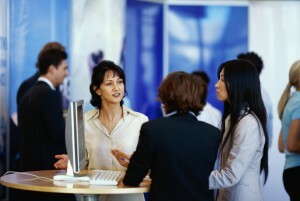 Below are some basic tips about trade show marketing. Are you going to stumble? Perhaps... but planning and careful execution will keep that to a bare minimum. 1. What are some basic tips you would suggest for a business going to their first trade show? Even if you majored in marketing, you probably learned diddly squat about trade show marketing. Which is sad since trial and error is very, very expensive at a trade show or event. My advice is to work with a professional, or at the very least, consult with colleagues who have gone through the process several times. Trade show success isn't hard -- if you know what you are doing and have done it repeatedly. In the end, it comes down to experience, planning, and flawless execution. 2. What advice would you have for a business that spends a lot of time at trade shows? Plan. Too often, companies treat trade shows like a last minute vacation. Successful trade show marketing requires pre-show planning and promotion, staff training, and post-show follow-up -- at a minimum. Attendees no longer just arrive. They decide who to visit based on research and company needs before they arrive at the show hall. Gone are the days when attendees would meander through the show hall. They identify who they want to see and spend time at those companies. It's rare that attendees “discover” a new vendor at a show (which is why pre-show marketing is critical). 3. How can a business with a small budget design an eye-catching display at a trade show? First, decide on your goals for the show, which can change from show to show. What is your key message? What problem are you solving? What do you need? A large monitor? An iPad? Literature trays? Product shelves? There’s nothing wrong with starting small if your graphic is appealing and the message clear. Finally, ensure the graphic is designed by someone who understands trade show graphics. Trade show graphics are very different from a magazine ad or a website, and most graphic designs are unfamiliar with trade shows. Most importantly, work with an exhibit design professional, i.e., someone with a history of successful clients not just a history of exhibit sales. Over the long run, the real cost of a trade show is not the display, which is fixed, but everything else -- travel, meals, pre-show marketing, booth space, drayage, and salaries. Those costs can be managed with careful planning. 4. How is a trade show different from doing business in a brick-and-mortar location in terms of the way employees interact with potential customers? You may find this surprising. Except for the venue, it’s not really different. It’s as simple as having knowledgeable people who have solid sales and customer service skills in your booth, including senior management when possible. Greet visitors, listen, ask open-ended questions, and document the answers. Don’t drink coffee in the booth, eat, or text, or read email. All the things you would tell someone working at a typical retail store. In the end, it’s about getting to the booth on time, approaching people, and being friendly and honest. Dress appropriately, keep the workspace organized and tidy, and act professional. A trade show is not a vacation. It’s your job so arrive sober, polish your shoes, and iron your clothes. One last suggestion -- Never ever check your smartphone in the booth. You might as well be picking your nose. It sends the same message -- Go Away! Have questions? Send me an email or call. I promise to give you more than my "bare minimum." For more information about trade shows or event marketing, give us a call or Contact Us. We welcome the opportunity to assist you with your next show.